Hi Terry, My great uncle Walter Sargeant 321903 was a pioneer with "E" Special Coy, Royal Engineers. He died in a trench explosion March 18, 1918 and is remembered on the memorial at Pickworth in Rutland. How do I find out where he was and what his unit was doing on that day. I have found out it was the first day of the German assault on the Western Front. I am in Canada so not able to visit the National Archives or the RE museum to research. We have communicted some time ago I think. I think you helped me to establish that my My Dad Christopher Grieves served in the Special Brigade. Does my information here gel with yours? Terry, I am researching a trench raid (see this thread: click here) which was supported by an officer and a number of ORs from No 4a Special Bn, Re. The OC was one Captain C.A. Garden. I just wondered if you had come across him. 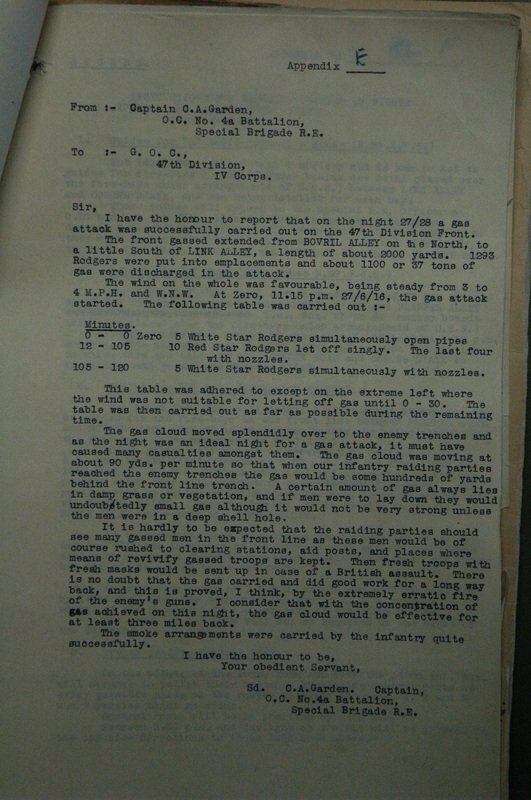 I would be interested to know how many Special Bde men would have been involved given that 1,055 cylinders of gas were discharged. Here is his report for your info. Thanks for the report. Captain Charles Garden MC served with 8 Oxs and Bucks Light Infantry, before transferring to the RE' s on 18th July 1915. His first command was 188 Company, which was one of the original special units who launched the first British gas attack at Loos. From Godalming, Surrey he was a mining engineer by profession. In November 1915, he took small detachment along with chlorine cylinders, to Alexandria, from where his small party was supposed to move to Gallipoli. This was cancelled however when the Government decided not to use gas against the Turks on the grounds that they had not subjected allied troops to gas themselves. In February 1916, he was commanding H Company after the expansion of the Special Companies into a Brigade sized formation. Around the same time CH Foulkes, commanding the Special Brigade, formed a temporary Special Battalion, designated 4A, to support the proposed 5th New Army. This temporary unit was formed from C, J and O Special Companies and Garden was selected to command it from the 4th June 1916. In February 1917, he became OC Special Companies, 1st Army and after a spell in hospital from April to June, he rejoined the Brigade at it's depot at Helfaut thereafter becoming its Officer Commanding. He was demobilised in February 1919. Four men would operate a battery of 24 cylinders, although this could change according to circumstances, casualties ect. Substantially more men would be needed to carry in the cylinders of course, often three to a cylinder, which was brought through the trenches on an improvised stretcher. Hope this helps. As far as I'm aware, you have the correct information. Do you have a photograph of him? I you would like to contact me through the forum e-mail system with aas much information you have about him, I'll see what I can do to help. Terry, very many thanks for the information on Capt Garden MC and 4a Battalion. Most useful. Carrying of the cylinders into the British Front Line was done by a couple of companies of the 19th over 3 nights prior to the raid. Buried at Longueness Souvenir Cemetery at St Omer. Has anyone any information that might help me fill out the details of his service and how and where he may have died? HAs anyone any suggestions as to how I can find out how he won his MM? On Remembrance Sunday, I am conducting the Salvation Army services at Parkhead Corps Tollcross Road Parkhead Glasgow. He was the son of James and Rose Ann Caldwell, of 3, Dalmarnock Street, Parkhead, Glasgow. He was a member of the Salvation Army and would have been a soldier at the parkhead Corps. Do you have any further information on David Caldwell? I am working on a tribute to the men named on the memorial for the sunday morning service. Cecil Ryder was my grandfather and served in the war and survived. I do have a copy of his medal card. He was born and brought up in Leeds and at 16 years old was a dyestuffs chemist at the Yorkshire Dyeware and Chemical Company. No doubt this work experience led to him to being called up into the Special Brigade. He was 18 when he enlisted in December 1916 and after training at Withnoe Camp near Plymouth he was drafted to Helfaut, near St Omer, arriving here in April 1917. I understand he joined section 10 of F company, camping on the edge of a wood, some distance from Vimy Ridge. Here he experienced his first nightly visits to the front. He would go out into No Mans Land at night to dig-in cylinders of gas and projector drums. He remembered the area being periodically raked with German machine gun fire. Amongst the very small account I know of his service he mentions mustard gas bombardments in the sand dunes in Belgium; moving on to Ypres which was comparitively quiet after the terrible battles of earlier periods, and in April 1918 being in Erpinay near Armentieres. He recalled seeing the whole village burning in one huge fire. When the armistice came he was near to Nancy. Lorries were sent to the front to collect British prisoners and for the first time he saw the headlights used on these vehicles. His firm applied for him to be released early and he came home in February 1919. I understand he gained the rank of Lance Corporal. Terry, I wonder if you have anything further to add to the above? I would be grateful for any pointers to his active service. Here is another Special Brigade serviceman for your database, he is commemorated on the Widnes War Memorial in Victoria Park, Widnes Cheshire. Enlisted : Manchester, 20th January, 1916. Resided : The Lodge, Halton View, Widnes. Died of wounds in France on 27th June, 1916, aged 21. Buried at Beauval Communal Cemetery, Row B, Grave 17. Commemorated at St Ambrose church in Halton View. William Morrey was the second son of William & Lydia Morrey and died in No.4 Casualty Clearing Station on the 27th June as result of gas poisoning on the previous day. His sister, Mrs Dutton of Milton Road, Widnes, received a letter from an Army Chaplain, Reverend H.D.W. Dennison, CF, in it he wrote...."It is with deep regret that I have to tell you of the death of your brother, Pioneer W. Morrey. He was admitted into this hospital yesterday afternoon suffering severely from gas poisoning, and though everything possible was done for him, he died early this morning. I am burying him this afternoon with four of his comrades who suffered the same fate in Beauval Cemetery. May he rest in peace and, and may God comfort sad hearts that his loss will cause......"
An old boy of Simms Cross school, William Morrey also attended St Ambrose church and Sunday School and was a member of the Gymnasium at St Paul`s Parochial Rooms. On leaving school, he worked for five years as an apprentice gas & water fitter at the Corporation Gas Works in Widnes. Before his enlistment under the Derby Scheme he worked as a fitter at the Zoological Gardens at Belle Vue, Manchester. He joined up on 20th January, 1916 into the 14th Bn, The Manchester Regiment, regimental number 32486 and in March that same year was transferred to the Royal Engineers and sent to France. # Special Brigade, Royal Engineers was a unit formed to counter the German Gas threat, they were employed to dispense poison gas from the allied trenches towards the enemies lines, it is possible that William Morrey was gassed carrying out this task as accidents and the effect of shell-fire on the equipment caused leaks on a regular basis. Do you have him already or is he an addition. I assume this must be a Gas depot across the river from Plymouth? Many thanks for that Peter, and to all who have replied. Keep them coming. If I find any extra information about any of these men, I will inform you all. With regard to the SB Depot at Saltash, many of the men who went there were sent to the Porton Down Company at the Porton Experimental Establishment on Salisbury Plain. Lieut. Jesse Dell Berridge, MC, “J” Special Coy, RE was killed in action on May 24th 1918 and lies in grave II D 4 in the Bac-du-Sud British cemetery, Bailleulval, France. “Dell” aged 21, was the 4th son of Canon Jesse and Edna Adeline Berridge of The Rectory, Little Baddow, Essex. Thanks for that. I visited his home village last year. The rectory still stands and his name is on the memorial in the village hall. Just by coincidence, one of my other research areas is Army School Mistresses. Jesse Berridge's father conducted the marriage ceremony one of them in the church at Little Badow. I am trying to find a Sapper for an old guy in his 80s,the Sapper was his Grandad. I wonder if you have any details on this man so that I can research his war and get those questions answered ! I have bottomed out at Kew,he has no service or pension record that I could find. The details I have are from his MIC and a bit from old Bill (not the boys in blue,the grandson!). Sapper James Roy TAPPER,3 service numbers 1294 ; 4369 and 495117. Wounded twice. Survived the War, being put to Z Reserve on 29.4.1919. Old Bill has a phrase he tells me,in relation to which unit,he says Somerset and Dorset Brigades. I have been poking about the Catalogue at Kew and have a hunch that he might be referring to the 1/1 and 1/2 Wessex Field Companies,but that IS only a hunch ! I wonder if you could take a look and see if you have any data at all on this man in your research. I have asked RE Chatham what they can tell me but they say it will be several months before they can answer. His last number is a 1917 TF number. Assuming he started the war with them, it is one of a block issued to the 1st South Midland Field Company, 48th South Midland Division. The RE units for the for the Division came from Bristol. In 1917 , they were renamed 474 Field Company. Thank you. I will look into that. I would not be surprised if the 1 SMFC was a unit he joined after one of his woundings though. My father, 128680 L/CPL Joseph (Jim) Benjamin Lines, born Great Yarmouth 05 Mar 1899, enlisted with the Norfolk Regiment as PVT 22999 on 24 Jan 1916. He served 'at home' 24-01-1916 to 27-01-1916; 'BEF' 28-01-1916 to 27-01-1918; 'at home' 28-01-1918 to 18-4-1918. Sometime after his arrival in France, he transferred to 4 Special Coy, 5th Mortar Bn, Special Brigade RE, and was with this unit when awarded the MM vide London Gazette 21-08-1917 Page 8644. He received his discharge 'being no longer physically fit for war service' on 18 Apr 1918 and remained crippled for the rest of his life. He died in Braintree Hospital in 1972. My understanding is that his military records, including the citation for his MM, no longer exist and the foregoing information comes from scanty papers contained in what I think was referred to as a 'Red Book' given to soldiers on discharge. For all practical purposes, I left England in the early 1950s and although I was also a soldier then, sadly I never had an opportunity to talk to my father as an adult. I know that he was wounded on at least one occasion before the incident that left him totally incapacitated. I also have his MM. If you do not already have his details, I am happy for them to be added to your collection of names for the RE Special Brigade. Should you by any chance have additional information concerning his military service, I would of course, welcome it. One for your records is George Taylor, Pioneer 104085 Royal Engineers, Special Survey Company, Special Brigade, Flame Projectors. Appointed to Durham County Constabulary 1st February 1914 as PC747, 3rd class constable. April 1914 Recruit to Stockton. 1.8.1914 2nd class constable. 14.7.1915 Resigned to join HMF, enlisted Stockton on Tees. 29.10.1916 Died of wounds in France aged 24 years. Cpl 197441 Fred Parkinson Long, "A" Special Company Royal Engineers. Born at Rawden, Yorkshire 9 Nov 1891, the son of John William Long, a warp dresser, and Bessie Long of 392 Leeds Road, Nelson, Lancashire. He went to Carr Road Elementary School and was admitted to Nelson Seconsary School on the 9 Nov 1904. He won an Oxford Senior Pass in 1908 and an Oxford 3rd Hons. in 1909. He left school on 24 June 1909 to become a student teacher at Trinity College, North Wales. Previous to joining the army he was assistant master at Bradshaw Street Council School, Nelson and a member of the choir at Scotland Road Primative Methodist Church. He played full back for Colne football club. He enlisted in February 1916 at Chester, in the Chester Yeomanry, afterwards transferring to the Manchester Regiment, and later to a special company of the Royal Engineers. he was recorded as the second Nelson teacher to be killed in action on 21 July 1917. His brother Lawrence, a science master at Douglas Secondary School, Isle of Man, served for eighteen months in the same regiment as Fred, but was then transferred to a research departmnt at the Ministry of Munitions. FredParkinson Long is remembered in the Book of Remembrance of Nelson Secondary School. Terry, Have you got this one? William (Billy) Henry Turtelbury: 220302 Pioneer, J Special Company, Royal Engineers. DoW 10-11-17, at 11th Stationary Hospital, Rouen, (severely wounded 23-10-17, sent to 43rd CCS), age 23. Only son of William & Susannah Turtelbury, 180 Creek Road, March, Cambridgeshire. Enlisted January 1917, to France April 1917. A chemist in Southend. St Sever Cemetery Extension, Rouen, France. Listed on the town war memorial in Broad St, March, Cambs, & the March Grammar School memorial (now located in the Neale-Wade Community College). Many thanks to John Lines, John (Hett65), FredW and Cliff Brown for taking the time to post this information. It is very much appreciated. Over the past few years I have been compiling a roll of men who served in the RE Special Brigade and Special Companies. ....would like to hear from any forum member who has information about any individual whom they believe served in the Brigade. Unit: 4th. Spec. Co. R.E. He seems to have enlisted in March 1917, and was admitted to No.1 Canadian General Hospital on 18 Aug 1917. The hospital diagnosis was P.U.O. (Pyrexia of Uncertain Origin) but family legend has it that he was gassed. He never spoke about it and, as a child, I never asked any questions. After a year in hospital he was eventually discharged from Springfield War Hospital, no longer physically fit for war service, on 26 Aug 1918. (diagnosis: Neurasthenia). He went on to achieve academic success in Chemistry and in Music but died of a stroke in 1952. It is interesting that another contributor to your database mentions a man who was killed by German action exploding our gas shells on 18 Aug 1917. I wonder if it was the same place. How could I find out where it was ?? ps. My father changed his name to Stirling before marrying in 1933.